BendPak - XPR-15CL-192 - 15,000-lb. 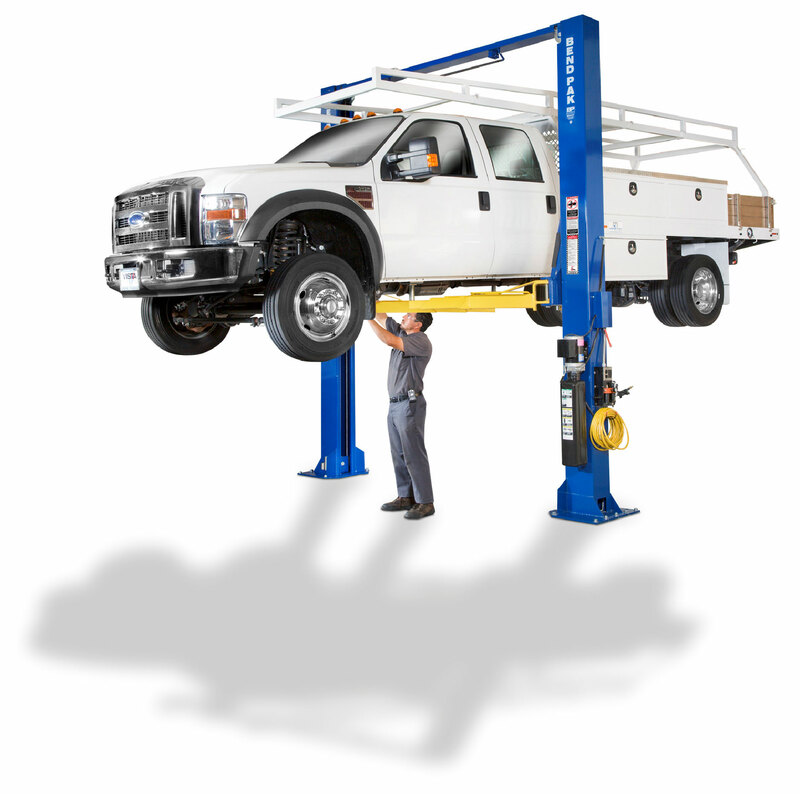 Capacity Two-Post Lifts - Gary Bloom Sales, Inc.
BendPak super-duty two post car lift models are designed for the most demanding use, and offer the greatest features to make your shop more productive, all while providing you with years of trouble free service. Featuring heavy duty steel construction, along with design features to provide convenience and the ultimate in safety. 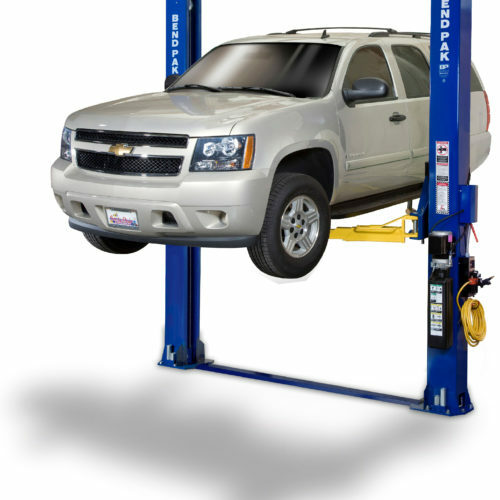 You’ll see why BendPak lifts are right for your busy auto garage. The safe and rugged XPR-15CL-192 two-post lift features extended height columns for added overhead clearance and an adjustable top beam to accommodate wide or narrow installation set-ups. The highly sophisticated yet simple and dependable XPR-Series design requires very little service or maintenance for an overall lower cost of ownership. All BendPak’s XPR two-post models feature dual “direct-drive” low-pressure cylinders, maintenance-free UHMW load bearings, single-piece columns, extra-tall lifting carriages and dual-stage arm configurations for increased arm positioning versatility. Our newest line of XPR-Series 2-Post lifts offers a wide selection of durable, safe and reliable systems for virtually every lifting application. Specifically, the powerful and secure super-duty XPR-15CL-192 is an incredibly rapid lift with a robust menu of features to increase efficiency and productivity, without overwhelming you with serviceable parts and necessary maintenance. The results are lower operating expenses and higher productivity. If you’re looking to make more money in less time than ever before, you’ll find that the new XPR-15CL-192 lift is the perfect addition to your shop— especially when you work with heavier vehicles that require larger lifting capacities. But just because this super-duty model was designed for the big stuff doesn’t mean it can’t handle your light-duty work as well. The two-post XPR-15CL-192 easily has the capacity to lift your largest full-sized pickups and commercial vehicles, yet still provide specific capability for sport and compact cars, both foreign and domestic. The XPR-15CL-192 is a 15,000-lb. maximum capacity, close-top model lift with full-reach arms that collapse to standard lengths and lower lift pads that clutch standard passenger automobiles, yet still hold the big guys as well. The columns are also placed wider for trucks with fixed towing mirrors, and the overhead equalization beam is up and out of the way for those “high-cube” delivery vans. Sound complicated to operate? Don’t worry. When it comes to ease of use, our dual-synchro equalization system and user-friendly controls are the stuff of legends. 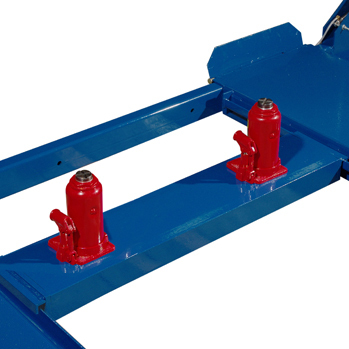 All of BendPak’s heavy-duty clearfloor model lifts feature dual “direct-drive” low-pressure cylinders that minimize leakage and reduce the workload placed on the entire hydraulic system. This exclusive BendPak design feature saves you maintenance costs throughout the life of your lift—you aren’t going to find friendly sensibility like this anywhere else. Some more BendPak XPR-Series exclusives include: 16 individual maintenance-free UHMW load bearings, single-piece columns, extra-tall lifting carriages and oversized cable sheaves to vastly extend the life expectancy of moving suspension components. And, to better cater to your specific lifting needs, we offer similar model lifts with optional specialty arm configurations. Bottom line—when you buy BendPak, you can expect a significant boost in performance and life expectancy. In fact, your BendPak XPR-15CL-192 might be the last lift you ever purchase. No one surpasses us in quality and safety. Not now, not ever. When you get a BendPak, you get more than just a fantastic lift. You get peace of mind. That’s the BendPak benefit. Lifting Capacity* 15,000 lbs. / 6,804 kg. *Max Capacity / Front Axle 7,500 lbs. / 3,402 kg. *Max Capacity / Rear Axle 7,500 lbs. / 3,402 kg. 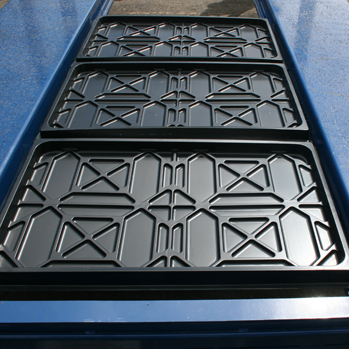 B – Width Overall (Outside of Base Plate): 155″ / 3,937 mm. C – Width (Outside of Columns): 144″ / 3,658 mm. E – Inside Columns: 120″ / 3,048 mm. F – Reach (Front Arm Min. ): 39″ / 991 mm. G – Reach (Front Arm Max. ): 60″ / 1,524 mm. H – Reach (Rear Arm Min. ): 39″ / 991 mm. I – Reach (Rear Arm Max. ): 60″ / 1,524 mm. J – Min. Pad Height: 5″ / 127 mm. K – Rise: 69″ / 1,753 mm. L – Max Lift Height (Pad Only): 74″ / 1,880 mm. M – Max Lift Height (6″ Adapter): 80″ / 2,032 mm. N – Drive-Thru Clearance: 106″ / 2,692 mm. Max Load Per Arm: 3,750 lbs. / 1,701 kg.